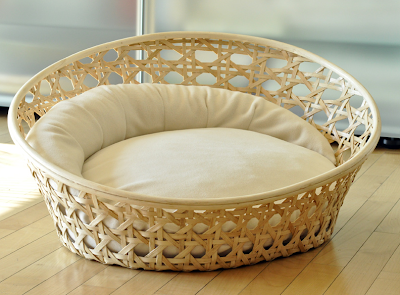 And what pup wouldn't look pretty chic in this Nook felt basket? Here's their backstory: two German designers decided one day back in 2005 that their cat, Mrs Schmitt, deserved a more cushy napping spot. Being designers, they decided she must nap in style! They loved the results so much that they opened their own store. All products are handmade in Germany with a focus on cushions that will maintain stability and shape for a long time (can you say "German engineering"?). Just recently, they opened an online store and to celebrate, they're offering shipping free to the U.S. and Canada. As we said, spendy - but well made. Go browse and see their other designs at pet-interiors.com. They're every bit as gorgeous. They are just great and different too. Have a fabulous Friday. I really like that top one. It's so stylish and beautiful. Okay... the peep really likes the beautiful stylishness of it. Personally, I'm thinkin' it would be good for scratchin' and chewin'. Wicker furniture is, anyway. Know that for a fact. We especially love the Nook! Maybe if Waffles had a nook, he wouldn't have to sleep on top of Glogirly's head. Those look like nice beds. I got a wicker bed years ago. It cost a hunnert dollars. I begged Pop for it and then used it once. It was on last year’s Christmas card. It eventually got shipped off to A Call 4 Paws for their cat sanctuary. That Arena basket sure is beautiful! Purrs from the Zee and Zoey Gang! The first bed looks furry classy !